You may have folliculitis and not even know it. In fact, this common skin ailment is often misdiagnosed and therefore mistreated. Take a look at our guide to causes, treatments and whether or not it is contagious. Folliculitis is often mistaken for acne and then improperly treated. While acne is caused when hair follicles become clogged with dead skin cells and oil, folliculitis occurs when the hair follicle becomes damaged and then inflamed. Both ailments can produce similar red painful bumps that may become filled with white pus. It’s no wonder many try acne medications on their folliculitis and then wonder why they are not seeing any results. 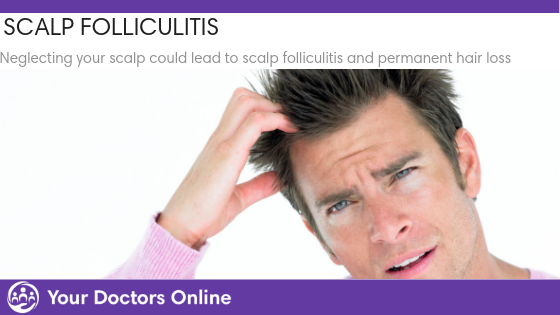 Folliculitis is caused when the hair follicle becomes damaged. This can happen in a number of ways. One of the most common is when the hair follicle gets damaged during shaving. This is known as ‘pseudofolliculitis barbae’ or more commonly as ‘razor burn’. Why do hairs become ingrown? Most people have experienced the painful red bumps that can appear after shaving. Most commonly referred to as ‘razor burn’ these small bumps are the result of hair that has failed to grow properly and has become stuck under the skin’s surface. This is called ‘ingrown hair’. Ingrown hairs are common in hair that is curly because the curl can cause the hair to grow into the skin rather than out. Clogged hair follicles can also make it difficult for hair to grow out of the skin and forces hair to grow sideways. Shaving too close to the skin can also cause hairs to become ingrown. Ingrown hairs aren’t the only way that shaving can cause folliculitis. Any cut in the skin can leave hair follicles susceptible to bacterial folliculitis. 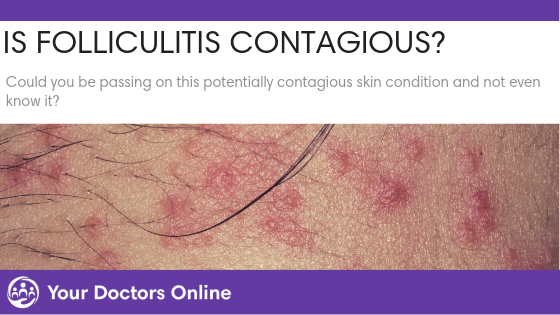 This type of folliculitis is characterized by itchy, red bumps filled with pus. This occurs when a staph bacteria that lives on the skin is able to cause an infection through a break in the skin. While many types of folliculitis are caused by damage to the hair follicle, others are simply spread by improper hygienic conditions such as ‘hot tub folliculitis or pseudomonas folliculitis. This type of folliculitis is caused by the pseudomonas bacteria which lives in hot tubs that are not properly maintained. When the body is exposed to this bacteria, it can produce a rash of small red round spots in the area that the bathing suit was worn about 24-48 hours after exposure. Avoiding hot tubs and heated pools where the ph and chlorine levels are not properly maintained and showering immediately after going in a hot tub can help prevent this type of folliculitis. If you find your red bumps are appearing on your back, chest or arms you may have pityrosporum folliculitis. This type of folliculitis occurs when naturally occuring yeast bacteria gets under your skin and into the hair follicle. This can easily be mistaken for acne and also occur alongside acne as oily areas in the skin feed this type of bacteria. If traditional acne treatments are not working for your red bumps you can ask your doctor to determine if you actually are suffering from pityrosporum folliculitis. Doctors can take a small skin sample to diagnose if your symptoms are caused by this fungal infection. Avoid sharing towels, face cloths or other personal items. Your folliculitis may require a prescription from your doctor. If your inflammation does not improve or gets worse, contact your healthcare professional. In some extreme cases, laser hair removal is an option as it destroys the hair follicle. While not all types of folliculitis are contagious, some can be. Some forms of folliculitis are caused through infectious agents and therefore can be transmitted through skin to skin contact. These agents can also be transmitted by sharing personal items such as razors, towels and face cloths. Swimming in poorly maintained hot tubs, whirlpools and heated pools can also spread folliculitis. 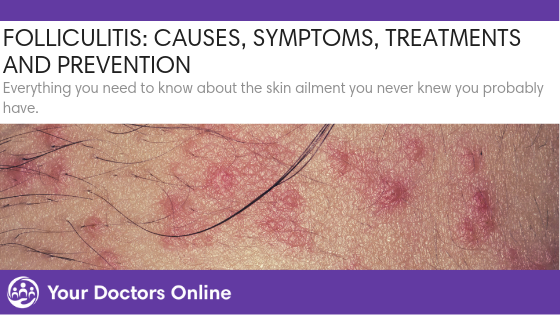 Many skin conditions are hard to self diagnose as they can all appear to have very similar symptoms. While making an appointment to see a dermatologist means lots of time, money and suffering in silence, there is a better way. Your Online Doctors gives you access to a medical doctor 24 hours a day, seven days a week. Simply download our free app to be automatically connected to one of our doctors at the touch of a button. Make taking care of your most prized possession-your health- easy by downloading our app today. Put the power of great healthcare in your own hands.